The Harrison Township Police Department is participating in a statewide campaign to enforce drinking and driving laws through Sept. 4. Mayor Louis Manzo (right) swears in new full time patrolman Anel Kalabic (left) at the committee meeting on Aug. 21. Holding the bible is Kalabic’s fiancé Kristine Collins. Harrison Township Committee passed an ordinance prohibiting parking along Church Street, while an additional full-time police officer was sworn in for the police department at last week’s meeting. Mayor Louis Manzo and the committee approved an ordinance banning parking along both sides of Church Street, between South Main Street and Eric Road, at all times. According to the ordinance, Church Street joins the westbound lane of Chickory Trail between the intersection of Sage Trail and Woodruff Trail, as well as sections of Clems Run Road where parking is against the law. Warning signs are to be installed in these locations. 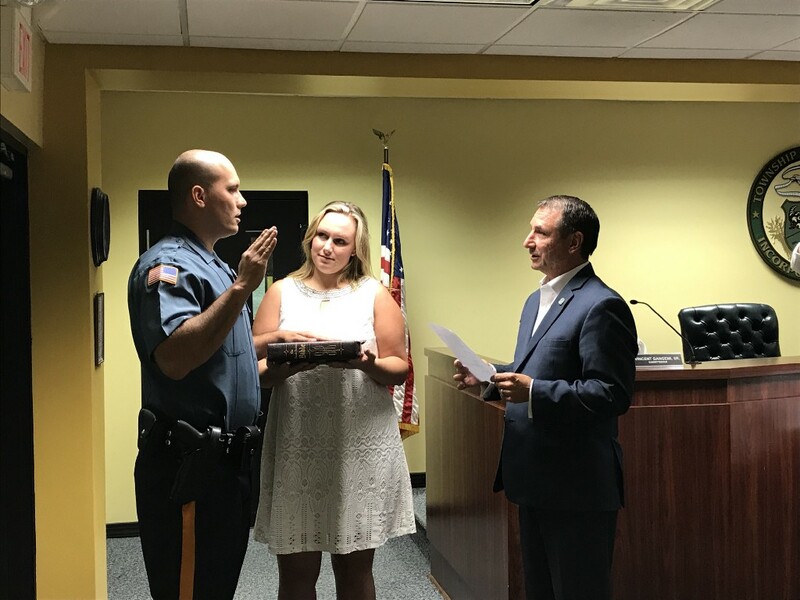 Also at the meeting, Manzo and the committee authorized the appointment of Anel Kalabic as Harrison Township Police Department’s newest full-time patrolman. According to Police Chief Thomas Mills, Kalabic is a veteran, having served four years in the U.S. Marine Corps prior to his hire. “Anybody who has spent more than five minutes speaking to Anel would know he is a genuine guy who cares about what he’s doing, and the commitment to making sure we are all safe and secure,” Mills said. Manzo swore in Kalabic with his fiancé Kristine Collins by his side. At the meeting, Mills provided the department’s activity report for July, which included 2,721 calls for service, almost 14,000 miles patrolled, 33 reports of crashes, 355 traffic summonses and 45 arrests, 19 of which were drug related, while seven were driving under the influence. Since Aug. 18, the police department has been participating in the statewide “Drive Sober or Get Pulled Over” grant program. According to Lt. Ron Cundey, the program will run through Sept. 4 with saturation patrols, having additional officers working specifically for the enforcement at various times throughout the day. According to Mills, six reported crashes were on Mullica Hill Road, two being in the Wawa parking lot, as well as six on Ellis Mill Road. However, Mills said there have been no reports of an accident on Ellis Mill Road since the county changed signage and painted the stop in the roadway. The committee approved a resolution awarding a contract for two Ford Police Interceptor Utility all-wheel-drive vehicles for an amount not to exceed $29,654 per vehicle, pursuant to the Gloucester County Cooperative Pricing Agreement and the county’s Cooperative Pricing System contract. According to Deputy Township Administrator Dennis Chambers, one of the vehicles will be used as a replacement for a total loss earlier in the year, paid for by the insurance company, while the other was included in this year’s capital budget. Additionally, a resolution was passed authorizing a state contract to supply one 2017 Ford F-350 4×4 pickup truck, not to exceed $31,199. Chambers said this was also included in this year’s capital budget and will replace a 14-year-old vehicle with approximately 150,000 miles. • According to Township Administrator Mark Gravinese, NJDOT will be repaving and making improvements from Pole Tavern Road to Gangemi Lane, beginning the week of Sept. 4. Work on the Main Street Bridge is not expected to begin until 2019. • Mullica Hill resident Ken Richardson asked the committee to allow community members to hang red ribbons throughout the township in honor of resident Brian Smith, 50 — who recently passed — his family, as well as the Hemophilia Foundation. Smith had been a coach for the recreation’s soccer team, therefore Gravinese suggested the ribbons be hung throughout the William Wilt Soccer Complex during September. Also throughout September, gold ribbons will decorate the township’s flower urns along North and South Main streets, as well as the trees in front of the Municipal Building to raise awareness for childhood cancer. • More information is to come in regard to a location to display artifacts retrieved from New York City, the Pentagon and Shanksville for this year’s 9/11 memorial ceremony.